Imagine rolling out of bed to find a huge horse hanging out in your spot like you’re the host of the weekly farm animal social. 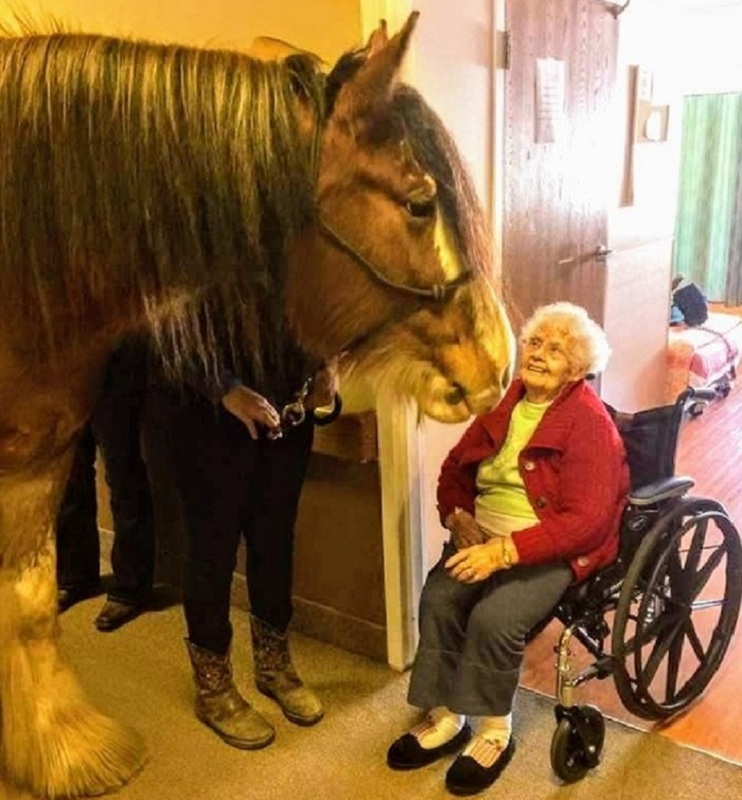 That is basically what happened when this giant Clydesdale horse visited residents at a nursing home. An endearing photo of the gigantic horse taking time out of its day to mingle with humans at an unidentified establishment recently surfaced on Reddit, and it’s a surefire way to get the feels flowin’. Studies show that horses have a tendency to hang out in cliques, but this precious creature decided to break away from the norm and devote some time to making the world a better place. "Clydesdale came to visit the nursing home today," the photo caption reads. Well, if you’re gonna get up close and personal with a horse, then a house call is a pretty special way to go about it, dontcha think? Plus, being in the presence of a horse has a ton of therapeutic benefits as shown by these miniature therapy horses greeting residents at a nursing home in Sweden a couple years back. And you thought people were doing yoga on horses just so they could get more likes on Instagram. Well, the social media attention probably plays a factor, but it’s mostly about the calming effect horses have on people and other animals. Honestly, there’s no way in hell a cat would ride a horse if it posed even a semblance of a threat, so we’d definitely be willing to allow these hooves to guide us to a zen state of mind.